Imaging mitochondrial dynamics in human skin reveals depth-dependent hypoxia and malignant potential for diagnosis. In this study, Pouli et al. showcase a new instrument for measuring endogenous fluorescence of the metabolite NADH in human skin cells. The instrument uses a 2-photon laser to excite NADH and collect its fluorescence at various skin depths. To account for autofluorescence of other molecules in skin such as melanin and collagen, the authors developed a post hoc filtering method to remove contaminating fluorescence. Owing to the enhanced fluorescence of enzyme-bound NADH in mitochondria, the authors further assessed morphology of the mitochondrial network in single skin cells. Based on these findings they created a diagnostic model for skin cancer using NADH imaging and successfully tested it in a patient. To validate their instrument, Pouli et al. performed ischemia-reperfusion type experiments on a human volunteer. NADH fluorescence was monitored at deep and superficial skin layers on the volunteer’s forearm while a blood pressure cuff was used to temporarily restrict blood flow. Deep layers of human skin access oxygen from the blood for aerobic metabolism, while cells in superficial layers obtain energy from glycolysis. Consistent with reliance of deeper skin cells on aerobic metabolism, NADH accumulated during ischemia in deeper layers, while NADH levels in superficial skin cells were unaffected by ischemia. 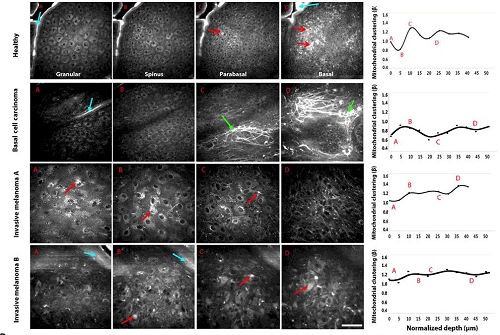 The authors observed a similar result when imaging epithelial tissue cultured from primary human keratinocytes. Exposing cultures to hypoxia induced an acute increase in NADH, indicative of diminished oxidative phosphorylation. Pouli et al. noticed that NADH increases during ischemia or hypoxia were accompanied by fragmentation of the mitochondrial network. Mitochondrial fragmentation decreases aerobic metabolism and shifts the cell’s energy source toward glycolysis; oxidative phosphorylation is more efficient in a fused mitochondrial network. Interestingly, the authors found that following exposure to hypoxia, skin cell mitochondria remained fragmented for several minutes after NADH levels had returned to normal. This suggests that assembly of mitochondrial fusion machinery lags behind metabolic changes. NADH imaging also revealed distinct stratification of mitochondrial morphology in human skin. Superficial and stem cell layers display a fragmented morphology, while proliferating cells between those layers have fused mitochondrial networks. Such stratification was absent in tissue from study participants diagnosed with melanoma and basal cell carcinoma. Using this dataset, the authors generated a predictive model for skin cancer diagnosis for use with NADH imaging that could reliably differentiate cancerous tissue from healthy or merely inflamed tissue. To test the diagnostic potential of the NADH imaging instrument, Pouli et al. conducted an experiment with a patient with confirmed melanoma just prior to biopsy. The site of the original melanoma and 3 other macroscopically suspicious sites nearby were imaged, then biopsied for traditional diagnosis. Both assays confirmed the known melanoma, and also identified one of the 3 other sites as melanoma. Although the instrument is currently expensive and sample size in this study was small, the authors conclude that NADH imaging has real potential for noninvasive skin cancer.